The wonderful Persian and Himalayan Dams of Victorian Gardens Cattery are highlighted on this page. Our dams are a large part of our family. All our foundation dams have a DNA test called a SNP Array Genetic Evaluation performed on them. The SNP DNA Evaluation tests their DNA for numerous diseases as well as if they are carriers for certain coat colors. The Test has been preformed by various labs, through CFA, over the years. All our foundation dams are PKD, FELV and Feline Aids tested negative, including any new outcrossed dams. As of February 1, 2012, our policy is to have all our current and new foundation line dams two years and older, cardiac ultrasounded for HCM and every one to three years thereafter. This HCM screening is a very positive move on the part of our Cattery as our Veterinarian says that at least 40% of the Persian and Himalayan lines are now affected by the HCM gene. Cardiac Ultrascans are the only way to detect this horrible disease in a Persian and Himalayan cat or kitten. To find out more information on HCM, please visit our HCM articles to learn more about this disease. We will adopt out our retired dams to great and loving homes where they can enjoy their retirement. You may find our adoptable retired dams on the "Available Adults" page. 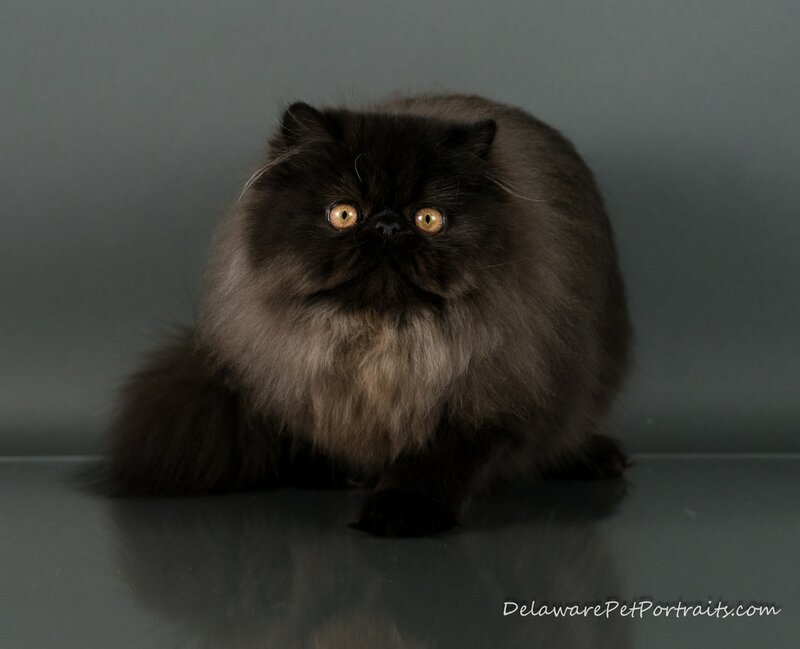 Our breeding lines include a National Winner, Regional Winners and Grand Champion bloodlines (within two to five generation pedigree) which include the following Catteries: Purrinlot, Stepp'nstone, Katpourri, Kitkas, Joleigh, Southpaw, Chrishanna, Red Sky, My Ty, Polcann, and Homerkits. Our Champion lines (within five generation pedigree) come from some of the following Catteries: Catillak, Farallon, Ezluvin, Kayleen, Kitkas, Riell, Aristochet, Uno Belgatto, My Ty, Crayola Cats, Foxy, Fur, Lotapurrs, Policann, Tittusville, La Chatrue, Maurarista, Purdy, Cactusways, Stepp'nstone, Kilkatz, Mibarben. Unaffected: HCM Cardiac Ultrasounded on August 11, 2018 (1 1/2 years old), by Dr. Kate Meurs, Cardiologist at NC State Veterinary School and Hospital. Unaffected: HCM Cardiac Ultrasounded on 11/11/2017 (1 1 /2 years old), by Dr. Kate Meurs, Cardiologist at NC State Veterinary School and Hospital. Unaffected: HCM Cardiac Ultrasounded on August 11, 2018 (3 years old), by Dr. Kate Meurs, Cardiologist at NC State Veterinary School and Hospital. Unaffected: HCM Cardiac Ultrasounded on August 11, 2018 (4 years old), by Dr. Kate Meurs, Cardiologist at NC State Veterinary School and Hospital. Unaffected: HCM Cardiac Ultrasounded on 11/11/2017 (3 1/3 years old), by Dr. Kate Meurs, Cardiologist at NC State Veterinary School and Hospital. Unaffected: HCM Cardiac Ultrasounded on 11/11/2017 (4 1/2 years old), by Dr. Kate Meurs, Cardiologist at NC State Veterinary School and Hospital.